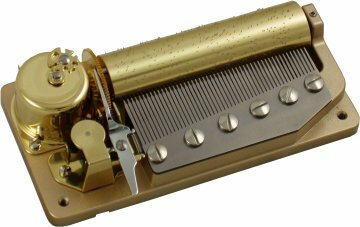 A superb quality musical movement playing 1 tune in 2 parts, 1 tune in 3 parts or 3 different tunes on a 50 note comb. The solid bedplate provides a good base for a rich beautiful sound. The movement plays non stop by holding the lever over, or stop in between each tune if required. For more information on the musical movements, please click here.